Alan’s books include the bestseller Believing Cassandra: An optimist looks at a pessimist’s world, The Sustainability Transformation, and Sustainability is for Everyone. They have been translated into several languages and adopted for use by universities, companies, and professional training programs. His most recent book, Parachuting Cats into Borneo (co-authored with change management expert Axel Klimek), was recommended by global business leaders such as Paul Polman (CEO Unilever). It offers practical advice on the process of leading change. From 1992-2018, AtKisson served as President of AtKisson Group, a sustainability services social enterprise that he founded in Seattle in 1992, and which continues as the Sustainability Accelerator Network. SusAccel.net has representatives in Asia, Europe, Australia, Latin America, and North America. He also served as President of the international Balaton Group (2006-2012), Executive Director of the international Earth Charter Initiative (2006-2007), and as a member of the President’s Science and Technology Advisory Council of the European Commission (2013-2014). From 2009-2017, he consulted to the UN Secretariat (UNDESA) and numerous UN offices in his role as an independent advisor. He also advised governments on their sustainable development plans and strategies. Alan AtKisson began his professional work in sustainability in 1988, editing the pioneering journal In Context. Producing a magazine put Alan in contact with many leading sustainability innovators, thought-leaders, and researchers. This exposure to sustainability’s foundational thinkers generated a strong motivation to turn their ideas into reality. AtKisson began focusing his own research on the development of tools, methods, and processes to accelerate change, and he devoted his professional work to the mainstreaming of sustainable development in government, business, and civil society. Beg inning in the early 1990s, AtKisson helped to establish the practice of developing sustainability indicators, working with cities and other entities around the globe. He was a co-founder and co-chair of the world’s first urban sustainability indicators program, Sustainable Seattle. He began to promote the concept of being a “sustainability change agent” — someone who drives change towards sustainability in organizations or communities — and over time he evolved a suite of tools and methods, now called the Accelerator, to support schools, institutions and companies in developing systems-based sustainability strategies and plans, as well as for training people to promote and implement change more effectively. Early on, AtKisson pioneered a comprehensive, open-source methodology for doing sustainable development, a planning process now known as the VISIS Method (VISIS stands for Vision, Indicators, Systems analysis, Innovation, and Strategy). These tools and methods were documented in AtKisson’s 2010 book The Sustainability Transformation and have also been described in several academic papers. The VISIS Method is taught in professional training programs for sustainability and has been included in a United Nations toolbox for sustainable development. AtKisson has given hundreds of inspirational speeches and training seminars and has consulted to over 250 organizations, in over 50 countries. He also founded or co-founded a number of sustainability businesses and volunteer initiatives, including: the pioneering city-level NGO Sustainable Seattle (started in 1991 and still going), the AtKisson Group of consultancies (1992), the Center for Sustainability Transformation GmbH in Germany (2008), the 17Goals partnership for promotion of the UN Sustainable Development Goals (2015), and the Oslo Manifesto, which engages the global design community in making the SDGs a reality (launched in 2016, together with the Norwegian Center for Design and Architecture). A dual citizen of the USA and Sweden, Alan AtKisson lives in Stockholm. You can jump to other parts of this website below, or continue for more details about Alan’s previous work and links to related websites. AtKisson provided in-depth strategic advice and analytical support to global companies, NGOs, and governments for many years. His writing and thinking has been influential in several areas of sustainable development practice, starting with indicators of sustainability in the 1990s. In the 2000s he focused on developing and spreading strategy tools and methods for sustainable development and on supporting organizations to become leaders in that field. In the 2010s he focused on strategies for economic transformation, including how to advance the “Green Economy”, transform the finance sector, and make investment in the “Blue Economy” of the sea more sustainable, in addition to supporting the United Nations Secretariat in its work to begin implementing the 2030 Agenda and the Sustainable Development Goals. AtKisson’s books have sold over 50,000 copies and have been used in university classes and professional training programs in several countries. President José Manuel Barroso of the European Commission appointed AtKisson to his advisory council on Science and Technology in 2013 (he was the only member of that council who was not formally a scientist or engineer). As founder of the international AtKisson Group, a social enterprise established in 1992, Alan AtKisson developed a professional network of Affiliates and Partners in a dozen countries. Participants in the AtKisson Group — renamed in 2018 as the Sustainability Accelerator Network — include academic centers of sustainability expertise in Sweden, the US, Thailand, Russia, and Australia, as well as several non-profit foundations and private consultancies. In addition to training people on the use of Accelerator tools, members of the network also advise companies, governments, cities, and educational institutions on sustainability strategy, policy, research, and initiative design. In 2008, AtKisson and his colleague Axel Klimek began the process of establishing the Center for Sustainability Transformation GmbH, an international program of advanced training, consulting, and professional development support, based in Germany. Working with partner institutions around the world, such as the ASU School for Sustainability in the US and the Sasin Graduate Institute of Business in Bangkok, CforST provided numerous “Master Classes” in change and sustainability while also developing new workshop models, coaching programs, and simulation games that engage executives and students alike. 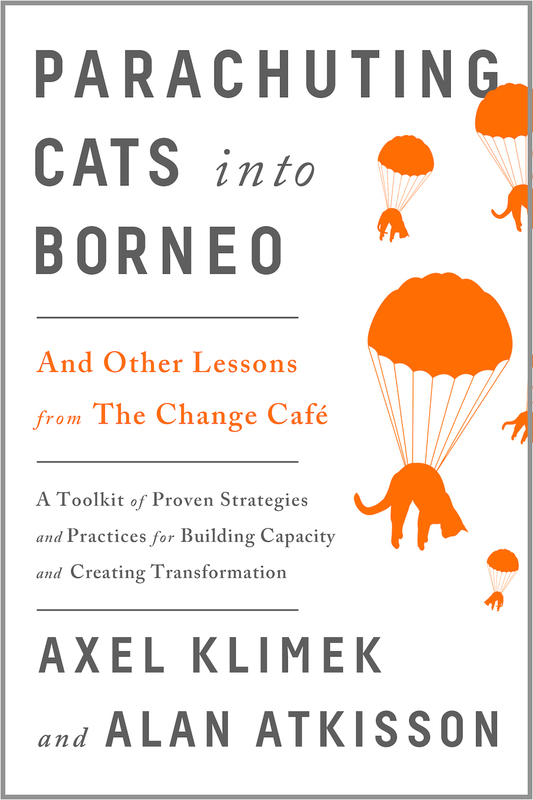 A book by Klimek and AtKisson, based on the Center’s highly integrated approach to change, was published in 2016 with provocative title Parachuting Cats into Borneo. Starting in 2011, working with colleagues Robert Steele and Lister Hannah, AtKisson helped the volunteer-driven NGO Compass Education get started, with an initial focus on Southeast Asia. The program has now spread to Latin America and the Middle East. Offering a “whole school” approach to sustainability, Compass Education spun off from AtKisson Group and established itself as a separate, not-for-profit organization. Its dedicated trainers provide professional development and empowerment programs to hundreds of teachers, students, and administrators in several international locations (with a special focus on international schools). In 2015, AtKisson developed and launched a new multi-stakeholder partnership and social media campaign called 17Goals, with the aim of promoting the adoption and implementation of the UN Sustainable Development Goals (SDGs). 17Goals, which involved over 20 organizations in a dozen countries, is officially registered with the United Nations, and the free tools and resources that it makes available have been downloaded many thousands of times by governmental, business, and educational programs to help introduce people to the SDGs, to deepen their understanding about them, and to get them engaged on implementing the SDGs in their local context. Educated in science, philosophy, and language at Tulane University (US) and Oxford University (UK), AtKisson was deeply affected by early sustainability books such as The Limits to Growth (1972). He first worked as a social worker and counselor, in both New Orleans and Southeast Asia; and he was selected to the Henry Luce Scholars program in 1981. In the mid-1980s, he was a singer-songwriter and rock musician in New York City. He also co-founded and managed a small designer clothing company, selling to department stores and boutiques in New York and across the US. In 1988 AtKisson changed gears dramatically, moved to Seattle, and began his career in sustainability by editing the award-winning journal In Context, which took a whole-systems approach to the newly emerging field (1988-1992). In 1990, he co-founded the Sustainable Seattle initiative, a volunteer-based program that created the world’s first city-wide sustainability indicators report, using a broad stakeholder engagement process. Sustainable Seattle became a model “Best Practice” (as formally recognized by the United Nations HABITAT II conference in 1996), and it was copied in many countries. In 1992, AtKisson founded the consultancy that grew into AtKisson Group and he began to work internationally, eventually relocating to Stockholm, Sweden, in 2000. When AtKisson was inducted into the Sustainability Hall of Fame by the International Society of Sustainability Professionals in 2013, he joined a list of honorees that included many of his own role models and inspirations in the field, including Ray Anderson, John Elkington, Hunter Lovins, Karl-Henrik Robèrt, and Hazel Henderson, among others. In response to being inducted, AtKisson wrote a reflective “letter to my colleagues” that became a very short (50 pages) bestselling book. Sustainability is for Everyone, first published in 2013 (and updated in 2017), has since been translated into several languages and has often been given out by companies or university programs to all their employees or alumni. AtKisson’s other full-length books include Believing Cassandra (1999), The Sustainability Transformation (2010), and Life Beyond Growth (2012); and a collection of essays, Because We Believe in the Future (2012). His Collected Poems were published in 2009. His latest book, Parachuting Cats into Borneo — and other lessons from the Change Café (2016) — is a supportive companion-guide to anyone promoting positive, transformative change, and co-authored with his long-time teaching partner Axel Klimek. AtKisson is a long-time member of the Balaton Group, an international network of sustainability researchers and practitioners founded in 1982 by Donella Meadows and Dennis Meadows (the lead authors of The Limits to Growth). He served as President of the Balaton Group (also known as the International Network of Resource Information Centers, or INRIC) from 2006-2012. In 2009, AtKisson was asked to serve as an independent advisor to UNDESA (the United Nations Secretariat in New York), initially working strategies for scaling up renewable energy in the developing world. He then helped the UN to plan and launch the UN Office of Sustainable Development (UNOSD), a global knowledge and capacity development center based in Incheon, South Korea, in 2011-2012. He subsequently provided internal strategic support to UNDESA on planning for the implementation of the Sustainable Development Goals (SDGs), supporting “pilot countries” on national planning processes and providing strategic and analytic input on a wide variety of other topics, ranging from knowledge management to partnership development and national progress reporting. He also directly supported UNDESA in the development of new strategy for advancing both internal and national-level capacity to implement the SDGs. AtKisson has also served as a transitional Executive Director for other organizations, on two occasions, first with the pioneering US-based think-tank in economic policy Redefining Progress (1996-1997, the organization is now dormant); and with Earth Charter International, a global NGO focused on the ethics of sustainable development (2005-2007). In 2015, he was elected a Full Member of the Club of Rome, the original sponsors of the Limits to Growth study. In the early 1990s, AtKisson began experimenting with the use of music and song in his keynote speeches, to bring stories to life and to help explain complex concepts. This creative approach drew positive responses, and as a result, Alan’s parallel career as a singer-songwriter — which he thought he had left behind in 1980s — was reactivated and became a regular part of his professional life. In 1997, AtKisson took a one-year sabbatical during which he released two albums and embarked on a world tour that combined speeches and workshops on sustainability with musical performances. During that year he also supported the development of city-based sustainability programs in Penang (Malaysia), Munich, Edinburgh, Pittsburgh and other cities. AtKisson has since released four more albums and two singles on the independent label Rain City Records. His music video for the single “We Love the SDGs” has been viewed 40,000 times. His music has been featured by the United Nations and adopted for use in UN-sponsored training and national education programs. A dual citizen of both Sweden and the United States, AtKisson lives in Stockholm with his wife, Kristina AtKisson, who is also a highly experienced sustainability professional. She currently works as Secretary-General of NMC, the Swedish Association for Sustainable Business.